HeartCry missionary pastors Richard Raven and Tsholo Kukuni serve together in Hope Bible Church in the university city of Bloemfontein, South Africa. In Tsholo's recent update, he shares a mix of joy and grief that is so common in a church body's life. 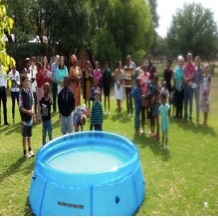 Recently we have had the joy and privilege of baptizing sister Tshiamelo. Sadly, in the same time period, Tshiamelo’s younger sister of 23 suddenly passed away. As she was walking to work with a colleague, an intoxicated driver lost control of his car and drove into them. The morning service attendance is growing. We average 50-60 people every Sunday. Richard just finished preaching on 1 Corinthians 13, and he is now going to preach a two part series on the qualifications and qualities of a pastor in preparation to induct Tsholo as an elder in the church. Sunday evening prayer meetings and preaching services continues to grow as well. We average 30-40 people. Tsholo has been preaching on the attributes of God, and he is about to bring the study to a conclusion. The other men have been preaching on the “One Another” texts of the New Testament, and are also about to bring the series to a conclusion. One of the most encouraging things for us as a church is our ongoing discipleship course for those desiring to be members at Hope, those interested in learning the fundamentals of our faith, and the members who want to grow in obedience to Christ. Friday nights our Young Adults meet for fellowship and study, consistently averaging 15-18 young adults. Many of them are university students.